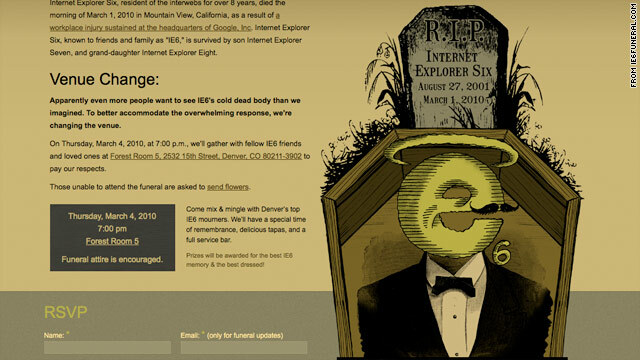 A Denver, Colorado, design firm posted this invitation to Thursday's "funeral" for Internet Explorer 6. (CNN) -- More than 100 people, many of them dressed in black, were expected to gather around a coffin Thursday night to say goodbye to an old friend. The deceased? Internet Explorer 6. The aging Web browser, survived by its descendants Internet Explorer 7 and Internet Explorer 8, was to be eulogized at a tongue-in-cheek "funeral" hosted by Aten Design Group, a design firm in Denver, Colorado. The memorial service was to feature a coffin holding a "body" that has an IE6 logo for a head. Attendees were expected to eulogize the Microsoft browser by sharing remembrances, some of which have already been posted on the company's online funeral invitation. "I feel terrible admitting this, but ... I never really liked him," posted someone who gave his name as Eddie Escher. "He had so many hang-ups, and he looked awful -- especially in his later years. But... he was always there when you needed him. You have to give him that." Internet Explorer 6 isn't exactly dead yet, and in fact remains widely used. But in recent years, it's been eclipsed by newer, faster browsers that are better equipped to run the Web's latest bells and whistles. Google Docs and Google Sites discontinued support for the browser Monday, and YouTube will follow suit March 13. "The web has evolved in the last ten years, from simple text pages to rich, interactive applications including video and voice. Unfortunately, very old browsers cannot run many of these new features effectively," wrote a senior product manager in a Google blog post. He urged users to upgrade to more modern browsers. Released in 2001, IE6 was the standard for Web surfing for most users until 2006, when Microsoft launched IE7. The most recent version, Internet Explorer 8, followed in March 2009. IE8 commanded 22.5 percent of the browser market last month, according to NetMarketShare, an analytics firm. Despite its age, IE6 still held on to 19.8 percent of the market in February -- more than IE7. Overall, Internet Explorer remains by far the most commonly used Web browser, ahead of Firefox, Chrome and Safari. This is not the first time someone has tried to bury Internet Explorer 6. A handful of Facebook groups are dedicated to killing off the browser, and an "IE must die" movement has circulated on Twitter. While Microsoft would not comment on Thursday's IE6 funeral, the company has consistently recommended that consumers upgrade to its latest version of Internet Explorer and acknowledges that its dated browser is no longer the most efficient way to surf the Web. "While we recommend Internet Explorer 8 to all customers, we understand we have a number of corporate customers for whom broad deployment of new technologies across their desktops requires more planning," a Microsoft representative wrote in an e-mail to CNN. Thursday's mock funeral was inspired by Google's decision to phase out IE6 this month, said Jon Clark, business development director for Aten Design Group. The Web site's funeral invitation reads, "Internet Explorer Six, resident of the interwebs for over 8 years, died the morning of March 1, 2010 in Mountain View, California, as a result of a workplace injury sustained at the headquarters of Google, Inc."
The funeral and online invitation caught the attention of thousands of people with similar hopes that IE6 will eventually be obsolete, including a group of people in Iceland who are hosting an IE6 funeral of their own. Clark said he initially expected about 30 to 50 people to attend the Denver funeral. More than 1,000 online comments and 6,000 Twitter tweets later, the company has had to move the event to a larger venue to accommodate interest. "We certainly didn't expect the exposure we've gotten," Clark said. So will mourners be shedding tears for IE6 on Thursday night? "Crocodile tears," Clark said. "It's all in good fun." But MG Siegler of TechCrunch, the technology news site, believes Thursday's service won't be the last that Web users hear of Internet Explorer 6. As many as hundreds of thousands of sites out there still support IE6 and in some cases were built specifically for it, he said. "It's going to be a hard sucker to kill," Siegler wrote in a recent post. "But at least a funeral will provide some closure until we find the body."